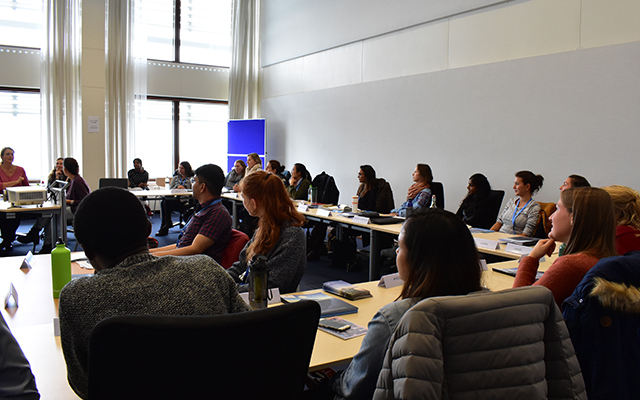 Twenty-one students entered the Joint Master’s Programme in Geography of Environmental Risks and Human Security as the Class of 2018-2020. They come from a diverse range of backgrounds, from 13 countries, with experiences from governmental, inter-governmental, and non-profit sectors, working on various environmental risks issues. The programme, jointly offered by the United Nations University Institute for Environment and Human Security (UNU-EHS) and the Geographical Institute of the University of Bonn, provides a unique combination of advanced conceptual and applied engagements with the field of environmental risks and human security in an international context. “Growing up in the disaster-prone rural Vietnam, I have witnessed firsthand the impacts of floods and tropical cyclones, and this drove me to study geography. Afterwards, at the International Center for Tropical Agriculture, I was involved in vulnerability assessment projects in Vietnam, Nicaragua, and Uganda. After my studies here at UNU-EHS, I want to help my community improve its climate resilience and adapt to climate change,” explained Than Nguyen Thi from Vietnam. After their studies, graduates might pursue with a PhD or work for worldwide organizations in the areas of risk management, environmental sustainability, and/or urbanization and resilience, applying the knowledge and experience they gained from the programme. Under a faculty from both UNU-EHS and University of Bonn, the class of 2018-2020 will study for three semesters, which includes an internship, then use the final semester to work on the master thesis. For more information about the joint master’s programme, click here.